Borya plays the “button accordion”, no keys, just lined with buttons on both sides of the instrument, and they all look the same….at least to me…. Now you should know these recordings are live, no overdubs or edits. We cut twenty some odd sides in an afternoon,,,all real playing, real music, real talent.!!! How’d they get so good? How in the world did you connect with these guys Chris? I was eager to meet the owner and hear what the balalaika sounded like with someone who knew how to play it.. I had no idea what I was about to see and hear. Sasha, a very likeable, smiling, warm-hearted guy, who incidentally didn’t speak English, and I didn’t speak Russian said hello with his smile and friendly greeting. 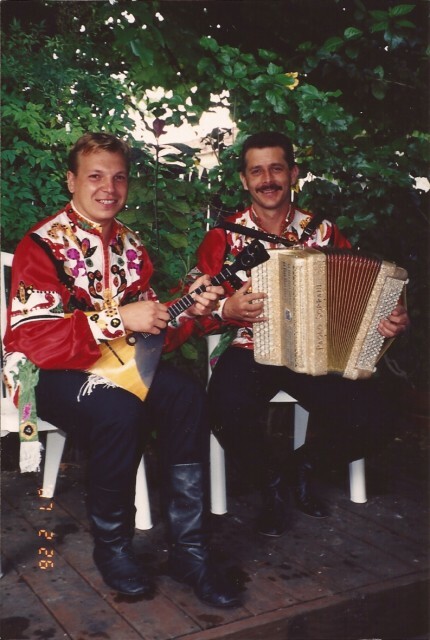 Then, he picks up the instrument off my bench and after a little fine tuning,,shreds a few high-octane Russian folk music and classical riffs. I couldn’t believe the chording and the single note playing..I was speechless…. Through an interpreter I asked if they had done any recording? No not really,,,so I humbly invited them to be my guest in the studio and do a little recording. They agreed,,,a day or two later we were in the studio recording the collection from which these samples are selected.